Charles Baker spends most of his time marketing and selling the wines of Niagara’s Stratus Vineyards. It’s a pretty sweet job that takes him on the road constantly to show the portfolio to sommeliers and restaurateurs across the province. It’s safe to say that Baker is a busy guy. But he still finds time to produce a nifty little Riesling that he carefully sources from choice Niagara fruit and bottles it under his own name. It’s made and sold at Stratus but it’s Baker who decides on fruit, style, yields and where to source what he feels are the best Riesling grapes in the region. His operation is what you call a virtual winery; he doesn’t own any winemaking equipment or have any of the infrastructure needed to become a full-fledged winery, but he does have an arrangement with Stratus and winemaker J.L. Groux. Baker has, until the 2010 vintage, made his single Riesling exclusively from fruit sourced in the Vinemount Ridge appellation and, more specifically, the Picone Vineyard, a small parcel of land dedicated to the brand. Mark Picone owns just two blocks of Riesling vineyards, which all go exclusively to Baker. Picone calls himself a steward of the land and combines his love of locally grown produce with a passion for wine. He and Baker found they shared a similar obsession for Riesling and the two set out to showcase the terroir, the region and the varietal from the hard clay soil of the Picone Vineyard. I wrote a story on this special relationship for Wine Access, which you can read fully here. 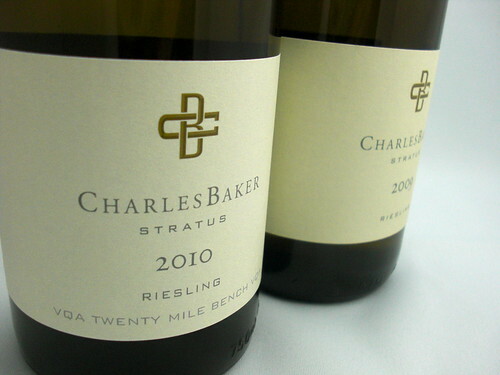 The Charles Baker Riesling 2009, now available at Stratus or through Baker’s website, is from the Picone Vineyard, as per usual, and there will be a 2010 Picone Vineyard Riesling, to be released in 2012, but the 2010 CB Riesling, available now, introduces Riesling lovers to a new vineyard, the Ivan Vineyard, located in Vineland in the Twenty Mile Bench appellation. This 12-acre mixed high-density planting includes a pristine single acre of Riesling planted late in the 20th century. 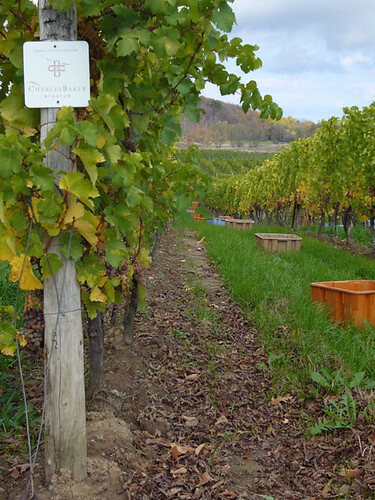 Planted in rows running south to north on a clay/limestone base, the vineyard benefits from the updrafts of Lake Ontario while benefiting from all the inland warmth of the growing season. It is owned by growers Bob and Lisa Nedelko. Baker said he cropped the Riesling perhaps a little too aggressively and ended up picking a measly 1.3 tonnes per acre. After an intense sort at the winery, the free-run juice was kept separate and ended up as the 2010 Ivan Riesling. Only 90 cases were bottled. It is a truly different expression of CB, and not just because of the hot vintage of that season. It leads the Baker “style” down a new path, one that is always a unique expression of the vineyard from where it comes. I have previously reviewed the CB 09, and CB 08 (which I still see occasionally in Vintages) and will include those reviews below along with the CB Ivan Vineyard 2010. 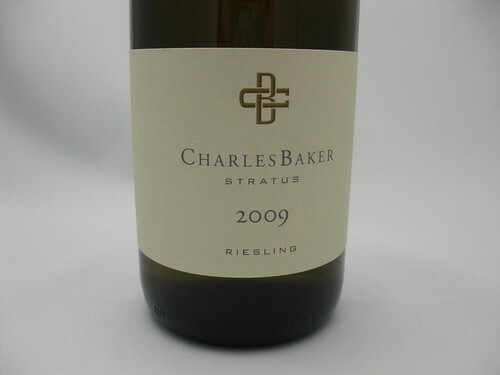 Charles Baker Ivan Vineyard Riesling 2010 ($27, 91 points) — The nose reveals sharp lemon-lime and grapefruit citrus, soft peach, orange zest and an alluring hint of stony minerality that is more about integration than a defining aromatic. It is very dry, with less acidity than previous CBs, on the palate and the rich flavours of lime and grapefruit are lifted by an interesting note of ginger on the finish. And through it all, this nice, edgy note of minerality adds to the complexity of the Riesling. Drinking beautifully now. Charles Baker Picone Vineyard Riesling 2009 ($35, 92 points) — A truly remarkable and unique expression of the Vinemount Ridge sub-appellation. A juicy core of highly extracted fruit on the nose with an underlying bead of minerality. It’s fleshy yet vibrant on the palate with layers of sweet citrus fruits, quince and wet stone minerality. Buy and hold for five years. Charles Baker Picone Vineyard Riesling 2008 ($35, 90 points) — The 2007 version was one of the finest rieslings made in that hot vintage. But it’s clear now that this wonderful grape really struts its stuff in cooler vintages, such as 2008. The ’08 version of Charles Baker shows perfect varietal fruit, with the flinty mineral notes that lovers of this grape crave. It’s drier than the 2007, but has enough ripe citrus fruit to balance out the racy acidity. This is a world-class riesling from one of the top three vineyards for this grape in Niagara – Vinemount Ridge. Surprising to see Stratus on the front label. And for sale at Stratus as if it is not a Baker wine but rather Stratus. Arthur, Stratus has been on the front of CB Riesling as far back as I can remember. It is made there. Don’t other virtual wineries include where it’s made on the label? Twenty Twenty Seven discretely says Featherstone Winery at the bottom of its’ back label, so I would guess it’s a matter of the individual agreements.